The form has been submitted successfully! We will contact you soon! Ideal for those traveling alone. Extra length queen bed with en-suite bathroom (Bath and / or shower). Ideal for those traveling as a couple. Extra length queen bed with en-suite bathroom (Bath and / or shower). Ideal for those traveling as a family with children. 1 double bed, 1 single bed and en-suite bathroom (Bath and / or shower). Ideal for the new bride & groom or a couple looking for that romantic getaway. Extra length queen bed with open plan en-suite bathroom (Bath and / or shower) & private toilet. Abiénto Guesthouse is located in the tranquil surroundings of Donald Murray Avenue, Park West. "Abiènto" is derived from the French translation of 'see you soon' was the inspiration behind the vintage French character of the house. 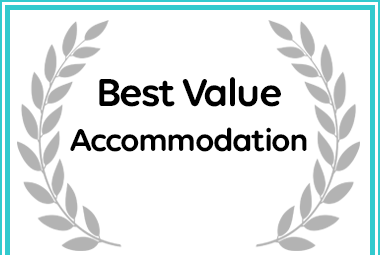 Abiénto Guesthouse in Bloemfontein received a Best Value Destination Award from Afristay.com.